An interesting article that clearly shows the utility of gamifiying various work-related processes. That said, I am somewhat hesitant that this piece is overly positive; failing to cite that gamification can, in certain cases, engender conflict in the workplace. More importantly, there is also no mention that gamification can lower employees' intrinsic motivation to work by offering external rewards with more discernible 'value' (be them monetary, trophy-based, or even simple bragging rights). Ultimately, an employee's intrinsic motivation to work will prevail over any extrinsic motivators, as their perceived value will inevitably decrease over time. According to the findings, gamification increases productivity levels for 90% of workers and increases awareness of co-workers’ goals and tasks for 86%. 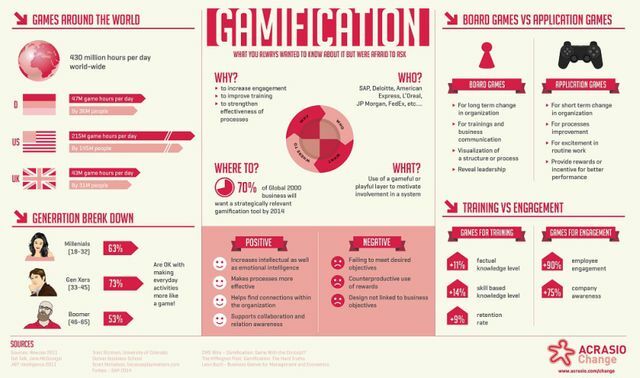 The top benefits of gamification, according to survey respondents, are increased engagement at work, inspiration to be more productive and increased focus and ability to stay on task. (30%, 27%, and 20%, respectively). Beyond increasing workplace productivity and engagement, game-based motivation has proven incredibly successful at motivating employees.